Bisque is a thick, creamy, highly-seasoned soup of French origin, classically of puréed crustaceans. It can be made from lobster, crab, shrimp or crayfish. Also, some people sometimes call creamy soups made from vegetables bisques. Left: A bowl of lobster bisque. It is thought the name is derived from Biscay, as in Bay of Biscay, but the crustaceans are certainly bis cuites "twice cooked" (by analogy to a biscuit) for they are first sautéed lightly in their shells, then simmered in wine and aromatic ingredients, before being puréed. Bisque is a method of extracting every bit of flavor from imperfect crustaceans not good enough to send to market. In an authentic bisque, the shells are ground to a fine paste and added to thicken the soup. Bisque are often thickened with rice, which can either be strained out, leaving behind the starch, or pureed upon the final stages. 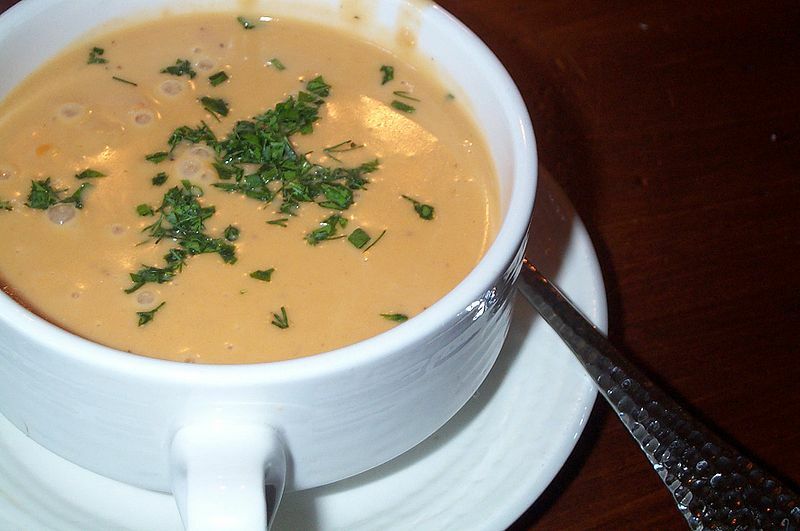 Seafood bisque is traditionally served in a low two-handled cup on a saucer or in a mug. Bisque is also sometimes used to refer to cream-based soups that do not contain seafood, in which the ingredients are pureed or processed in a food processor or a food mill. Common varieties include tomato, mushroom, red pepper, and squash bisque. First cook, grill, roast or fry your shellfish, lobster, crab, langoustine, or balmain bug until the shells go red. Remove the meat from tails and claws and set aside. If you're using leftover shells and have already eaten the tail meat, or if you just want extra body, prepare thin slices of scallop or monkfish. Remove and discard the gills from crab or lobster. Chop the shells roughly with a cleaver then fry in a shallow pan, turning as needed or roast in a hot oven until they are crisp and deep red. Add cognac or sambuca, and set light. Turn until the flames die down. Deglaze with sherry or wine. Now grind the shells finely. Traditionally this was done with pestle and mortar; or use a blender: blitz the shells, a few at a time with plenty of stock. Add the ground shells, rice, tomato, wine and stock to the mirepoix of vegetables. Simmer gently for one hour. Strain the broth through a fine sieve. Add cream, return to simmer. Season to taste. Briefly poach any additional seafood (such as cherrystone clams or small oysters), and finally add reserved tail meat. Serve hot, garnished with chervil and croutons.